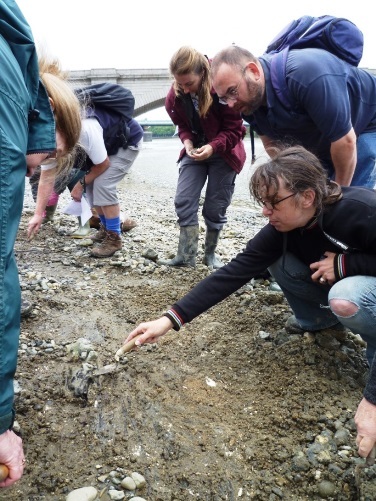 Thames Discovery Programme - Great Results For Fulham! 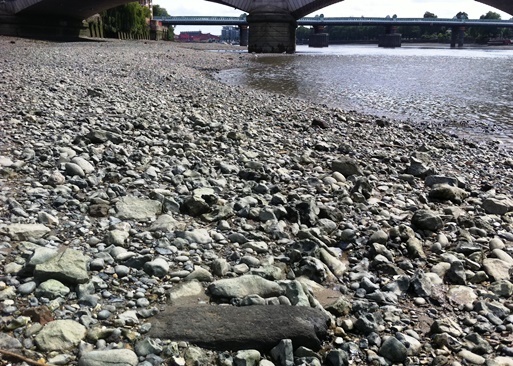 Having first come across a couple of parallel recumbent timbers on the Fulham Palace foreshore in July 2010 (Timbers 1 & 2), the Fulham FROG have kept a record of their visibility and the progress of their erosion. 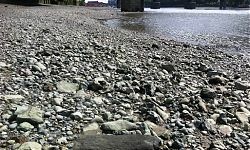 Situated just upstream of Putney Bridge, they were sited in an east-west alignment, following the line of the shore on a long raised bank and visible at medium to low tides. The first one that became apparent was 15cm wide and the second one 28cm wide and located 2.70 metres apart. 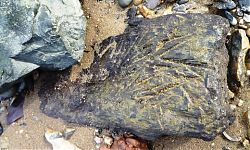 They were then flush with the foreshore surface with just their ends visible. Although there was quite a difference in size, the fact they were parallel made me curious. Some of you will remember these timbers which were also observed while recording the wattle feature in September 2013. As they are parallel to the wattle although on a slightly higher level it was suggested that these two features were probably not related. 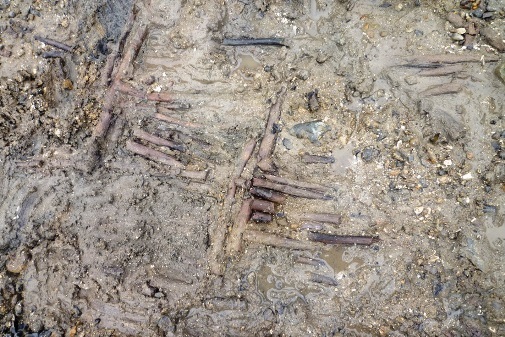 In November 2014 a third parallel timber (Timber 3) was located towards the east with interesting chop-marks on it, together with two further timbers (Timbers 4 & 5) running immediately south of it which appeared to be part of the same structure. On showing a photo of the chop-marked timber to ancient wood expert Damian Goodburn at the Foreshore Forum that year he suggested it was suitable for dating. The timber measured 11cms wide by 3.5cms depth. Its full length could not been determined as it was partially buried in the ground. 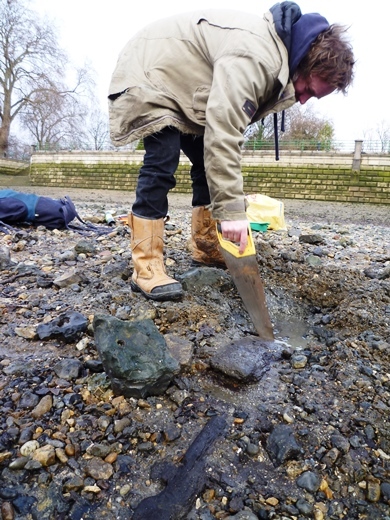 In January 2015 Elliot took a sample of the chop-marked timber and thus revealed the underlying timber which had a wooden peg that had been hammered through it indicating it was intended to remain flat on the shore. A bonus find! It has been suggested that this site could have been a mooring feature for boats, or possibly part of a revetment. These intriguing chop marks suggest to me that the associated timbers could have all been cut in situ. (Or maybe the catch of the day was trimmed there and then?!) April 2015 was the last time Timbers 1 and 2 were visible but the remainder of Timbers 3, 4 and 5 are still intact. 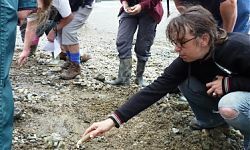 On a FROG monitoring event in August 2011 we were observing the area in the vicinity of the parallel timbers mentioned above when Nathalie pointed out a fair amount of shell incorporated in the gravel. Scraping just below the surface revealed some wattle. Situated just south of the above mentioned timbers, and also running in an east-west alignment parallel yet on a lower level, it was suggested that the wattle was probably not related to the horizontal timbers. It had remained covered until 2013 when we recorded it. 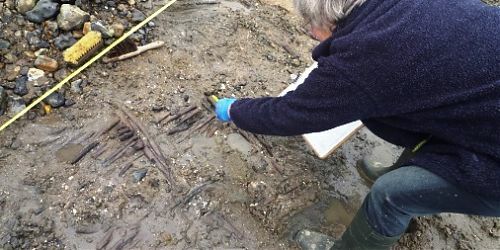 With tight time constraints as there was a lot to draw before the tide came in, we revealed it to be 7.50 metres in length and approximately 0.70m wide. A large flat pinkish boulder seemed to mark its eastern end. After cleaning and recording, we covered the area after as best we could to prevent further erosion. The shell layer has now eroded out but the wattle is still visible in parts only at lower tides. The whole area is becoming less accessible as the foreshore is flattening out a lot behind it. 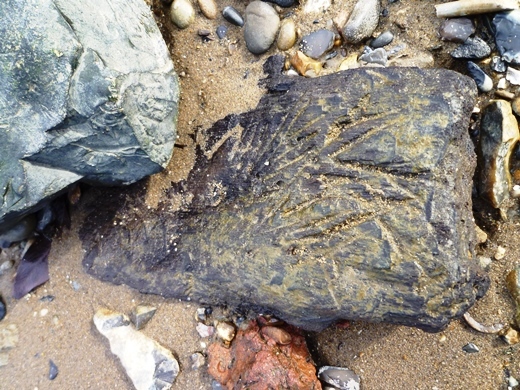 Radiocarbon dating of the sample from Timber 3 returned a date of AD608 +/-27, which is at the very end of the Early Saxon period, and predates the earliest documentary reference for Anglo-Saxon activity in Fulham; in AD704, land at Fulanham was granted by Tyrhtil, Bishop of Hereford, to Wealdhere, Bishop of London. 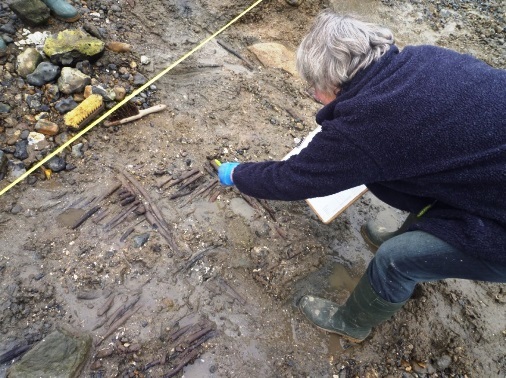 From the same period in the near vicinity, an Early Saxon fish trap was identified in the 1970s by the Wandsworth Historical Society across the river at Putney, and two others have been recorded further upstream in Hammersmith and Barn Elms. 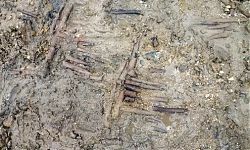 The sample from the wattle returned a date of AD951 +/-26, placing its construction during the Late Saxon period, and it is likely that is represents part of a fishtrap. 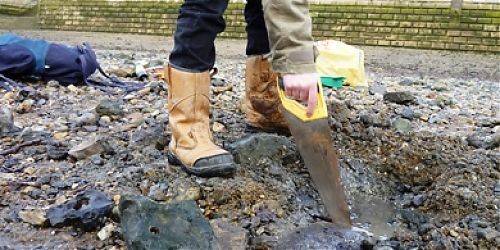 The discovery of surviving wattlework of Anglo-Saxon date on the Thames foreshore is extremely rare. The results confirm these two structures were not contemporary with each other, but give us the chance to view two different horizons in a close area. So, great thanks to all involved for giving Fulham another couple of stories to add to its timeline. And as erosion progresses, more will follow….